We created the MochaVinci by breeding our jet Black Ocellaris Clownfish (Darwin) with our DaVinci Extreme Clownfish. The MochaVinci Clownfish has inherited the classic swirly white pattern of the DaVinci Clownfish, but the red coloration has been replaced by a more golden and black coloration similar to that of Black Ice Clownfish and Maine Mocha Clownfish. 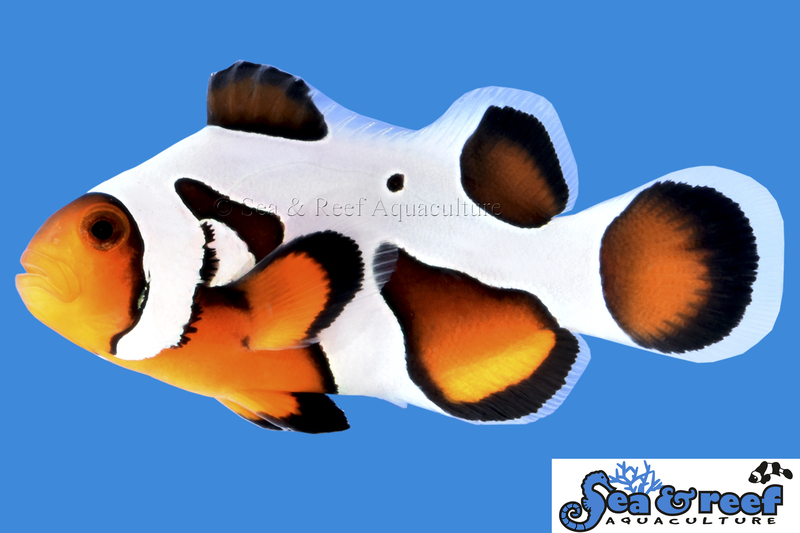 The white swirly patterns fall into the same variations as our DaVinci Ocellaris Clownfish and we are therefore releasing three grades: MochaVinci Clownfish Grade Extreme, MochaVinci Clownfish Grade A and MochaVinci Clownfish Grade B. The MochaVinci Clownfish Extreme have three fused stripes on at least one side of the body. This grade has the most white markings. Sea & Reef MochaVinci Extreme Clownfish have three fused stripes on at least one side of the body.